The festival is the signature event of the property’s award-winning CSR program, Sands for Singapore. An initiative through Sands Cares, Las Vegas Sands’ corporate giving program, the festival has raised nearly $15 million for local charities since its start in 2013. This year, the event will focus on deepening Marina Bay Sands’ support for the local community and providing the underprivileged with ways to showcase their skills and talents. For the first time, the festival will feature a line-up of activities and offerings co-created with local charities, social enterprises and beneficiaries. 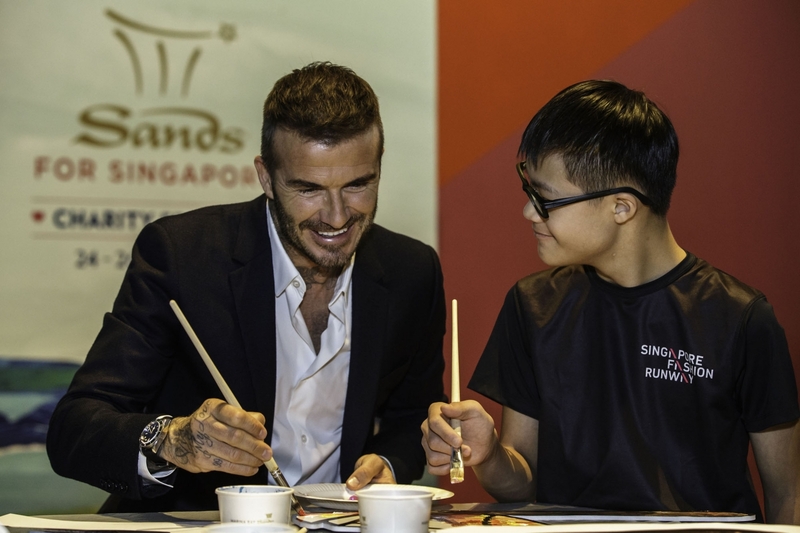 During Sands for Singapore’s kickoff event, Beckham was joined by Leong Sijun, a 15-year-old artist with Down Syndrome, who was commissioned by the Integrated Resort to create a special art piece that will be featured across this year’s festival branding. Sijun’s art shows the iconic three towers of Marina Bay Sands surrounded by water, to portray the Integrated Resort as a ‘big ship’ that carries and supports the community through its corporate social responsibility (CSR) initiatives. In an intimate art session at ArtScience Museum, Beckham and Sijun joined 15 children and youth beneficiaries from AWWA Family Service Centre and Singapore Fashion Runway to recreate the festival’s 2018 key visual to mark the upcoming charity event. The completed art piece will be on display during the festival. “It’s a pleasure to be back in Singapore for the launch of this year’s festival. I’m really proud to partner with an organization like Marina Bay Sands that uses their incredible platform to support the local community and raise awareness for talented young artists such as Leong Sijun,” Beckham said. Beckham helped launch the festival in 2013, and has since participated in numerous Sands for Singapore initiatives – from meet and greet sessions with aspiring youth athletes to a Christmas gift distribution with children from underprivileged backgrounds. The three-day event will allow for many opportunities for locals to join in by participating in the festival’s programs including the brand new Festival Hub at the Event Plaza and the Play It Forward charity challenge. To learn more about Sands for Singapore and other Sands Cares programs and initiatives, visit the Las Vegas Sands website.